Preheat the oven to 175°C/345°F. Line the springform pan with parchment paper. Place the sweet potato, with the skin still on, in a baking dish and bake for approx. 1 hr. Halve and pit the avocado, then scoop out the flesh and place in a bowl along with the flour, almond flour, cocoa powder, sugar, baking soda, baking powder, almond milk, vegetable oil, apple cider vinegar, and a pinch of salt. Using a hand mixer fitted with beaters, mix everything together into a smooth batter. Pour into the springform pan and bake in the oven at 175°C/345°F for approx. 35 min. Remove from the cake from the oven once done, and let cool down. When the sweet potato is ready, allow to cool slightly before peeling it and transferring the inside to a food processor. 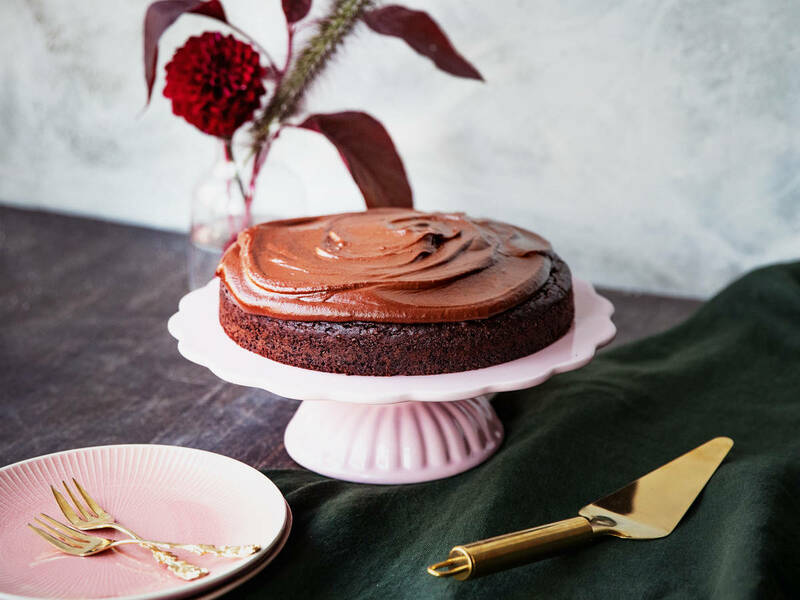 Break up the dark chocolate into small pieces and add to the still warm sweet potato puree and blend the two ingredients together into a smooth frosting. Spread on top of the cake, then serve, and enjoy!